Large witch pendant, miniature sculpture encased in a glass globe with red LED light Amazing one of a kind tiny witch sculpture housed in a glass globe with a little red light that can be turned on and off. This piece could be added to a chain and worn as a large pendant or could be hung up with string for a wonderful little sculpture. 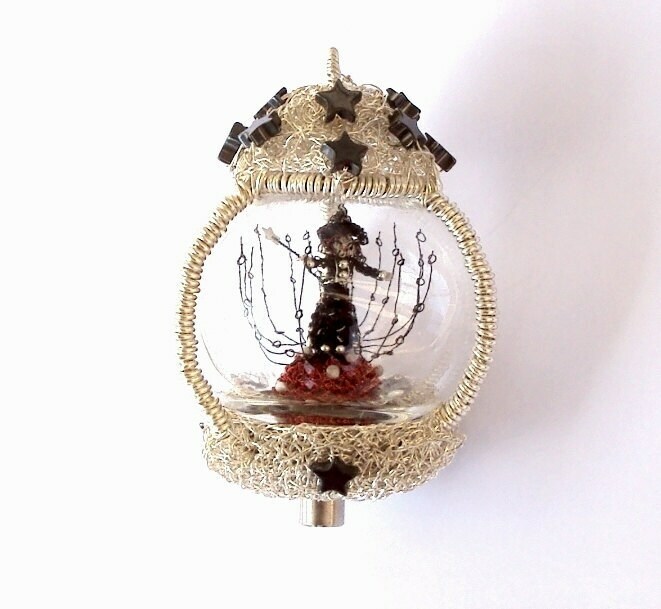 I created this piece first by created the little witch by crocheting and carefully sewing coloured and silver plated copper wire. The little witch is holding a wand with a little star sequin on the end, her tiny dress has silver plated bead details and she even has a little crocheted witches hat. The witch stands on a red crochet mound that has tiny howlite stone beads decorating it and under the mound I have put a little red LED light that can be turned on and off at the bottom, the battery for the light can also be replaced. I encased the little sculpture inside a hand blown glass globe and then secured the glass firmly in place by wrapping strong silver plated wire and finished the piece off by crocheting the top and bottom also with silver plated wire and adding lovely hematite star shaped gemstones. The pendant measures 7.5cm (3 in) tall and 5cm (2 in) wide.